Misty and I had a mini-vacation this weekend, heading to Atlanta to see yet another performance from 311 (our third within a year -- I think we can stop now, don't you?). On our way into town we ate at a burger joint in Little Five Points called The Vortex -- the outside of their building is shaped like a skull, and you enter through the mouth. 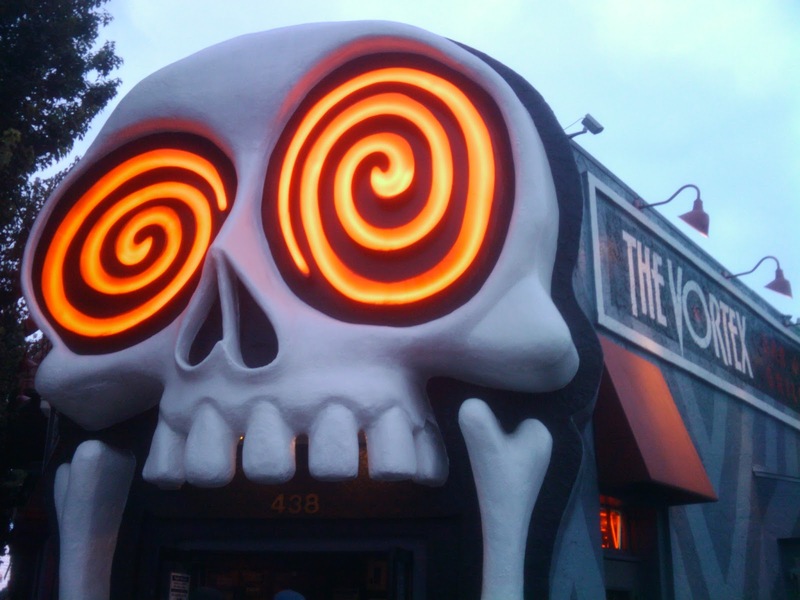 The decor may be creepy, but our burgers were superb. We got to the concert plenty early, so we had time to walk around the parking lot and check out the tailgating crowd. At almost any other show, there's an unwritten rule that you don't wear the t-shirt of the band you're going to see. It's concert fashion taboo. That's not the case with 311. The fans are very much a community. We saw plenty of people proudly displaying their shirts from past Unity Tours, the Pow Wow festival, the band's Caribbean Cruise, and 311 Day. After a while it started to rain, so we headed into the amphitheater to find cover. Our seats this time were right up front. There were only a couple rows separating us from the pit. Unfortunately, the sound was horrible. It was as if someone turned the treble all the way down on a stereo. You could hear a lot more bass and drums than guitar, and it was hard to make out S.A. Martinez's lyrics at all (oddly enough, everything sounded fine for both opening acts The Aggrolites and Slightly Stoopid). Nevertheless, we had a good time. In the morning we had breakfast at Dekalb World Market (I never tire of their ham & cheese croissants) and then stopped by Trader Joe's on our way out of town so we could finally replenish our stock of Corn and Chile Tomato-Less Salsa. That may seem an odd way to cap off a vacation -- even a mini-cation -- but you'd understand if you'd ever tried that salsa.